The MiR100 (mobile industrial robot) is a safe & cost-effective solution that can quickly automate your internal transportation & logistics. It allows you to free staff resources by optimizing workflows, increasing productivity and lowering costs. What can the MiR100 do for you? The MiR100 is extremely flexible and uses smart technology to adapt to different situations. If employees are spending too much time pushing carts & making deliveries, these tasks can now be automated. With the automation of transport tasks, employees now have free time to focus on high-value activities. The MiR100 transports up to 220 lbs (100 kg) and can also be mounted with customizable top modules like bins, racks, conveyors & collaborative robot arms. The top modules are easy to change so the robot is deployable for a variety of tasks. Not only is the MiR100 flexible & smart, it Is also safe and easy to program. The robot is capable of maneuvering around employees, through doors, and on & off elevators. 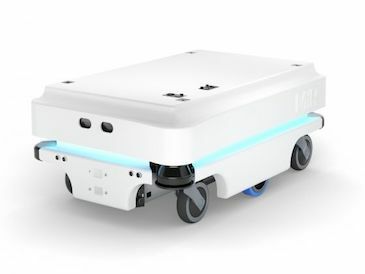 To program the robot, you can either upload CAD files of the building directly to the unit, or use a simple web-based interface which requires no programming experience. From there, the robot’s mission can be adapted from a smartphone, tablet or computer. With the MiR100 there is no need to alter your facility. It has built-in sensors & cameras which identify the surroundings. It analyzes routes to take the most efficient path while safely avoiding obstacles and people. No expensive and inflexible wires or sensors are needed.